Hi Andi! Can you tell us a little about your latest book? 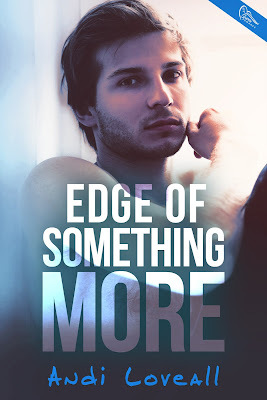 EDGE OF SOMETHING MORE is a NA contemporary romance about Devin, who’s twenty two and heading off across the country on his first big solo adventure. He soon finds himself working on a homestead in North Carolina and falling in love with Cora. She’s nineteen, beautiful, and not ready for a serious relationship. He’s ready to change his plans for her, but things get all screwed up. First I had this vision of Devin. I saw his life “in a flash,” as Raven, one of the homestead owners, says in the book. Then I saw him and Cora together, and I got a feel for their relationship. I’ve been in situations like theirs a few times. You have to make the choice between leaving someone behind or making sacrifices to be with them now. Even if you want to, you can’t always do it. Georgia McBride and I picked out the picture together, which was a fun and surreal experience. The model is hot, and I love the color. It captures Devin’s energy well. Good question. It’s hard for me to choose someone for Devin. I’m pickier about him, especially now that I’ve had to acclimatize myself to the cover model. For Cora, I used to think a young Evan Rachel Wood, but I think Chloe Grace Moretz could do it too. I’d like more books to happen, but we’ll have to wait and see! 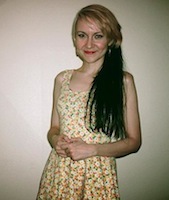 I write in different genres, and I am always working on something. It’s hard to predict where the path will go from here. It was first set in California, but halfway through writing it, I moved to North Carolina and stayed at a homestead there. The beauty of the landscape floored me, and I ended up reworking the entire thing with a new setting. It revived me, which I needed at the time. Relationships are hard, and being able to guide a love story is soothing for me. The HEA requirement keeps the romance genre a nice, safe zone. When I’m in a different mood, destroying people can be just as fun, which is why I also write horror! One day, it just came to me that this was what I was supposed to do. How do you come up with character names? Sometimes, they come to me the second I think of the character. I have other characters I’ve been working on for years, and I still can’t decide on a name. It drives me crazy, but it comes to me when it’s supposed to. After, because you have to see what your publisher will say. I’d never get attached to a title unless I planned to self-publish (which I’d like to try at least once). I’ll have a working title, but I do my best to stay open and have various options that I’m excited about. Every time I do an interview, I’m trying to name a different book. So, this time I’ll go with Butterflies are Free by Leonard Gershe. It’s a play. I usually envision people in moments of love or passion. Usually a couple, but sometimes just a solo person doing something. A scene or idea just comes to me, and I build a story around that. I loved White Oleander, even if it did leave out some of the most powerful parts of the book. I’ll go with two that inspired me as a kid: R.L. Stine and Ann M. Martin. I sleep without a pillow. I have neck and jaw problems and I find it’s less painful for me to stay completely flat. I don’t think there’s anyone who looks or acts like me, but people have told me I remind them of Jena Malone. I love her, so I’ll go with that. I’m from central California, one of the warmer places in the world. I didn’t know how good I had it until I lived other places and experienced winter. I plan to keep doing it. I’d like to write romance as Andi Loveall and darker, more tragic, and horrifying stuff as A.B. Loveall. Working in different genres is perfect because the two balance each other out. I can express and work on whatever appeals to my current mood. I’ve never made one. I’m not one of those people that wants to skydive or any of that. I hate heights. One of my bucket-list goals should be to make it through life without ever skydiving. I’d also like to write at least twenty more books, which will take me a long time, so another goal should be to avoid kicking the bucket at all. I need to stay alive to write books. Beauty and the Beast is cool. An artist. Writing is an art, so I guess my dream came true.